The ALERT platform is the industry’s largest and most compliant online global database for the maintenance and communication of account and standing settlement instructions (SSI). The ALERT platform enables a community of investment managers, brokers/dealers and custodian banks to share accurate account and SSI automatically worldwide. 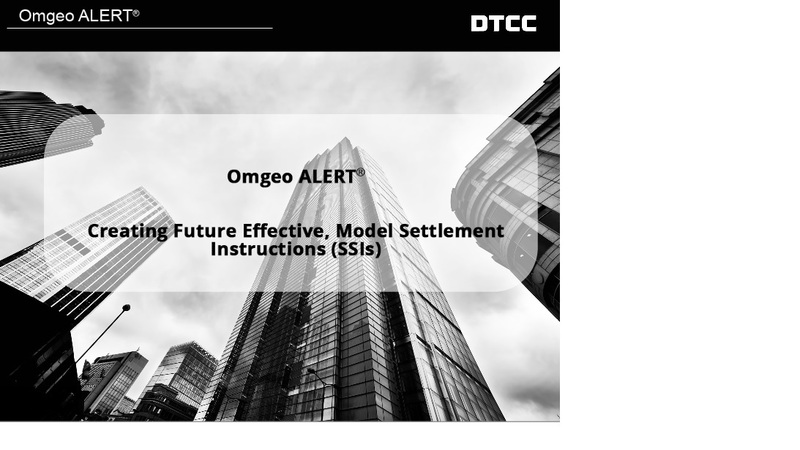 Detailed information about on how to enter your collateral SSIs in the ALERT platform can be found at DTCC-Euroclear Global Collateral LTD - Collateral Standing Settlement Instructions. Note: access to this area of the Learning Center requires registration. Click Login or Register in the top right area of this screen and provide a business email to begin the process. Data Authentication is applied to creation and maintenance of collateral SSIs. Further details on how this functionality works can be found at ALERT - Data Authentication. Documentation covering features, functionality and best practices that apply across multiple Institutional Trade Processing services. See the Cross-Product section. Guides outlining the functionality included in recent releases of the ALERT platform. Describes enhancements and defect fixes in the ALERT Web user interface and Open API Message Broker/Dealer specification in the March 2017 version 5.9 release. This document outlines the enhancements included in the ALERT platform 5.11 release. This document outlines the enhancements included in the ALERT platform 5.12 release, which is scheduled to go into the Client Test environment on March 15,2018, and into Production on March 24, 2018. This document outlines the enhancements included in the ALERT platform 5.13 release, which is scheduled to go into the Client Test environment on July 19, 2018, and into Production on July 28, 2018. This document describes the market updates available on the ALERT platform in January 2018. This document describes the market updates available on the ALERT platform in November, 2018. Describes new features, Market/Business Rules Changes, and defect fixed in the version 5.8 release. 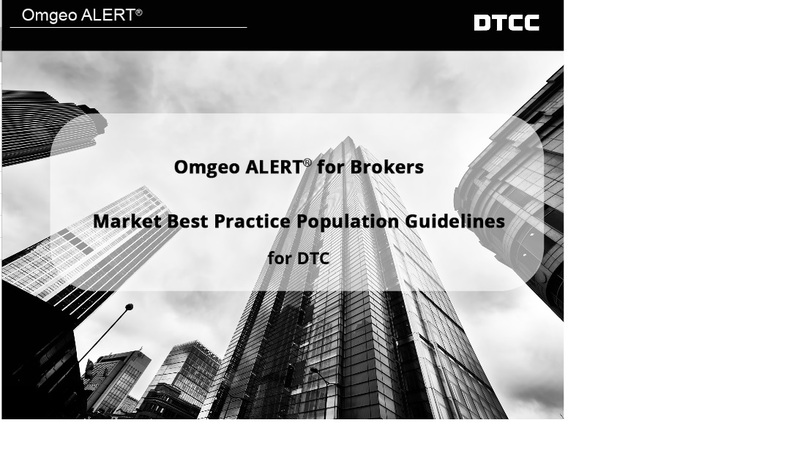 Describes updates to the ALERT platform's web interface, the new global custodian direct interface, updates to the broker dealer direct interface, data search functionlality (formerly DART reports), BIA upload templates, market/business rules, and character set requirements. Describes enhancements/defect fixes/business rule changes to the ALERT Web user interface contained in the June 2015 Maintenance Release. Describes new features and Market/Business Rules changes in the version 5.10 release of the ALERT platform. Describes enhancements/defect fixes/business rule changes to the ALERT Web user interface contained in the July 2015 Maintenance Release. Describes planned enhancements/defect fixes/business rule changes to the ALERT platform's web user interface in the October 2015 Maintenance Release. Describes enhancements to the ALERT Web user interface contained in the December 2015 Release. Describes enhancements/defect fixes/business rule changes to the ALERT Web user interface, Common Reference Data, and Market/Business Rules contained in the April 9, 2016 Release. Describes enhancements/defect fixes/business rule changes to the ALERT Web user interface, Common Reference Data, Market/Business Rules, and a description of the Open Application Program Interface (API) in the July 2016 release. Describes enhancements/defect fixes/business rule changes to the ALERT Web user interface, Collateral Code Support, and Market/Business Rules in the ALERT 5.7 release. Online help for the ALERT platform's web interface. This content is also available using context-sensitive links from within the application. ALERT Broker/Dealer Online Help New! The online help files describe use of the ALERT platform's web interface, and are also available using context-sensitive links in the application. ALERT Global Custodian Online Help New! ALERT Regional Custodian Online Help New! The online help files describe use of the ALERT platform's web interface for Regional Custodian. The online help is also available using context-sensitive links in the ALERT web interface. ALERT for Trustee Online Help New! Market-specific requirements/recommendations for populating global settlement instructions. Available for those countries where specific data population practices have been mandated/recommended. This document details the market updates included in the ALERT 5.14 release, scheduled for release into the Production enviornment on Marhc 16, 2019. This document describes ALERT platform best practices for SSIs (with BNP Paribas as the custodian and sub-custodian) where SMIs are needed for matching. 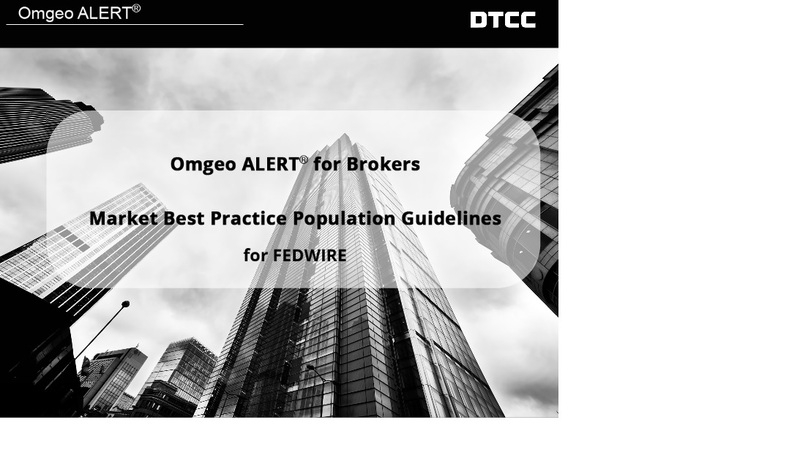 ALERT Market/Business Rules and Best Practices New! 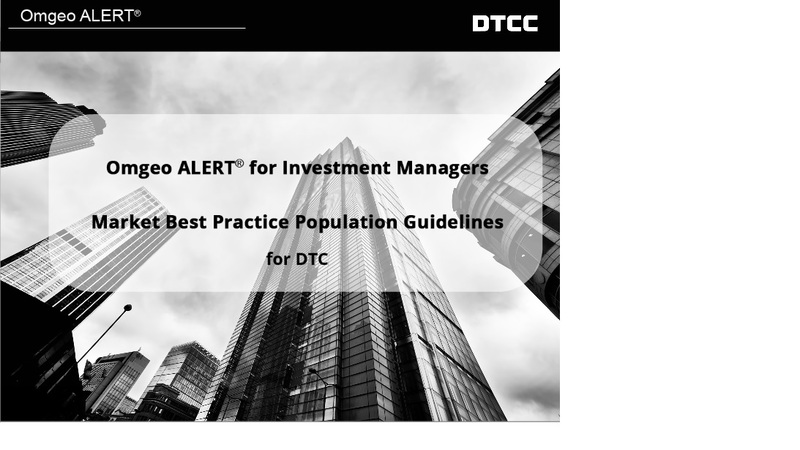 The Market/Business Rules describe ALERT platform market-specific best practices. This content is delivered in HTML5 format. ALERT Foreign Exchange Settlement Instructions New! ALERT platform Market/Business Rules for Foreign Exchange (FX) settlement. ALERT Settlement Instructions and Validation Rules New! Details the extensive rules validation for settlement instruction data intended for the ALERT database. Describes how the ALERT platform fields for standard, foreign exchange, and cash settlement instructions map to SWIFT fields. Documentation for implementing the ALERT Direct Broker/Dealer API. Includes Programmer Guides, DTDs , and Message Specifications. A zip file containing the DTDs for the ALERT Broker/Dealer Direct 4.1 Interface (Get_Method_by_Delivery9.dtd, Get_General_Account_Info_by_BIA9.dtd, Get_General_Info_by_Acronym_and_Access_Code9.dtd). Provides tests to validate your application's compatibility with the ALERT platform production environment. 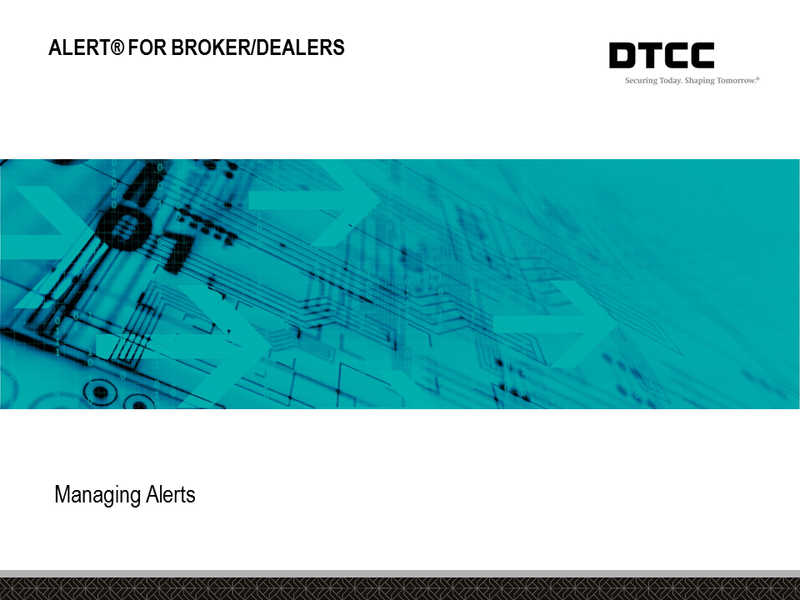 Message specification that contains the messages, data dictionary, and error codes for a broker/dealer ALERT direct client interface. A zip file of the Data Type Descriptors (DTDs) in Production. Describes the steps for creating a broker/dealer direct client interface to the ALERT host. Documentation describing the upload functionality available to ALERT Investment Managers and Global Custodians. Includes instructions and data format information. This document describes how ALERT global custodians view the status of the accounts assigned to their Acronym and view SIs associated with their Internal Account, using the A/C# @ Global Custodian field. XSD file for the ALERT GC Direct 1.0 interface. 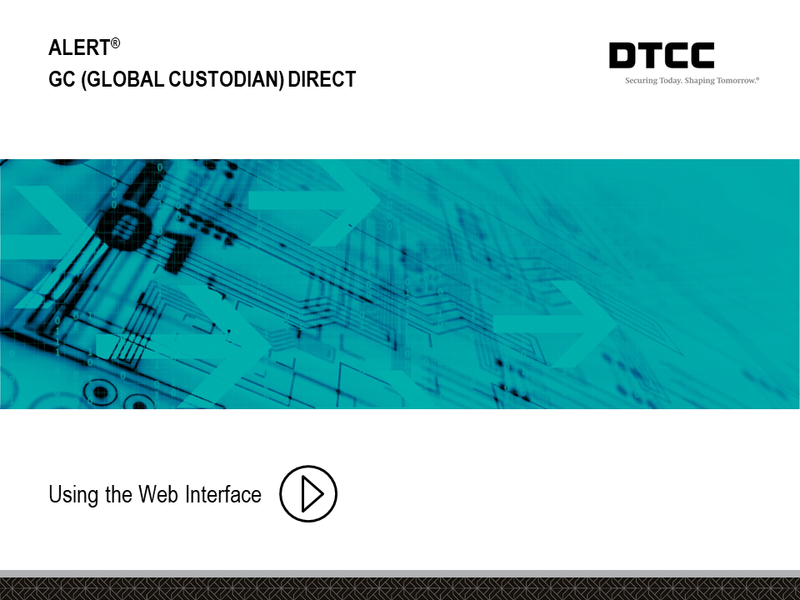 Contains the messages, data dictionary, and error codes for the ALERT Direct Global Custodian 1.0 client interface. 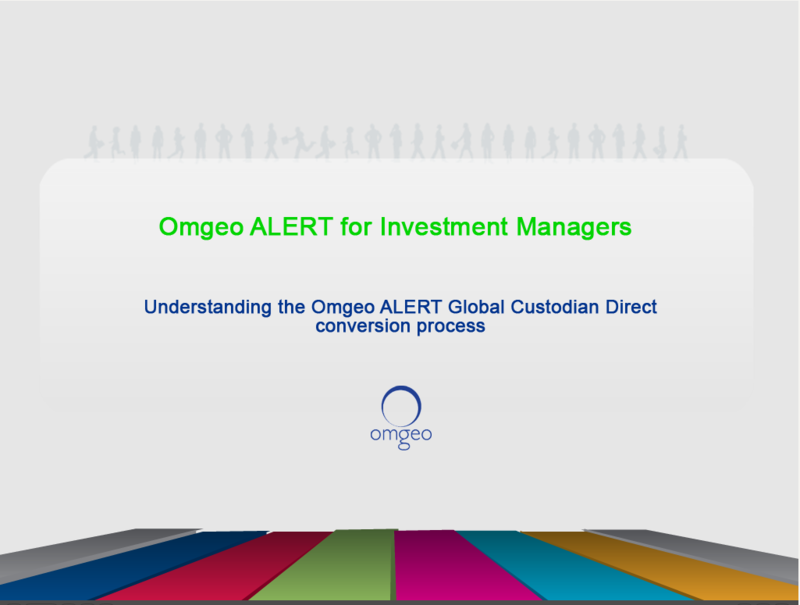 This document focuses on GC Direct information and the onboarding steps required for investment managers to implement the ALERT GC Direct interface. It contains workflow diagrams for onboarding different implementation scenarios, as well as for ongoing monitoring. General documentation related to the ALERT platform. Includes system requirements, how-to guides, and usage guidelines. This document describes how to set up new LEI functionality in the ALERT platform and how the enriched information is reported in the CTM service. 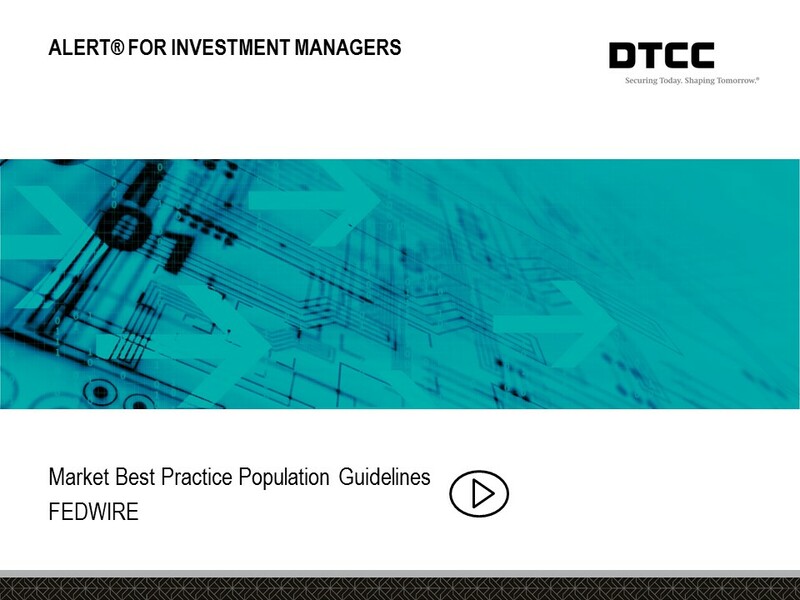 This document describes how to use the ALERT platform Data Search report to help determine what access codes may need LEIs to comply with MiFID II. ALERT Common Reference Data New! Provides tables of values for certain fields used in the ALERT platform's Web and Direct interfaces and in the ALERT Plus module. This document describes the contents of the ALERT platform Data Search files, their format, and how the fields map to the legacy DART fields. This document describes how to upload SI Scan files to the ALERT platform. Information on character sets permitted in all SSI Utility components: Broker Direct, Global Custodian Direct, and ALERT web interfaces. Describes the certified hardware and software for the ALERT platform. Lists responsibilities, standards, and guidelines for all users of the ALERT platform. Message specifications that contain XML schema format message details and error codes for the ALERT open application program interface. Message Specification that contains the messages and error codes for the ALERT open application program interface (API) for broker/dealers. Investment Manager message specification for the ALERT Open API interface. Message Specification that contains the messages and error codes for the ALERT open application program interface (API) for vendors. Documentation describing the upload functionality available to ALERT platform Investment Managers and Global Custodians. Includes instructions and data format information. Describes uploading ALERT Plus files to the ALERT platform (global custodians). Describes uploading ALERT Plus module files to the ALERT platform (investment managers). Guides that detail Trustee and Regional Custodian workflow management within the ALERT Web user interface. This document focuses on GC Direct information, the onboarding steps required to implement GC Direct, and the SSI monitoring process for regional custodians. This document focuses on GC Direct information, the onboarding steps required to implement GC Direct, and the SSI monitoring process for trustees. 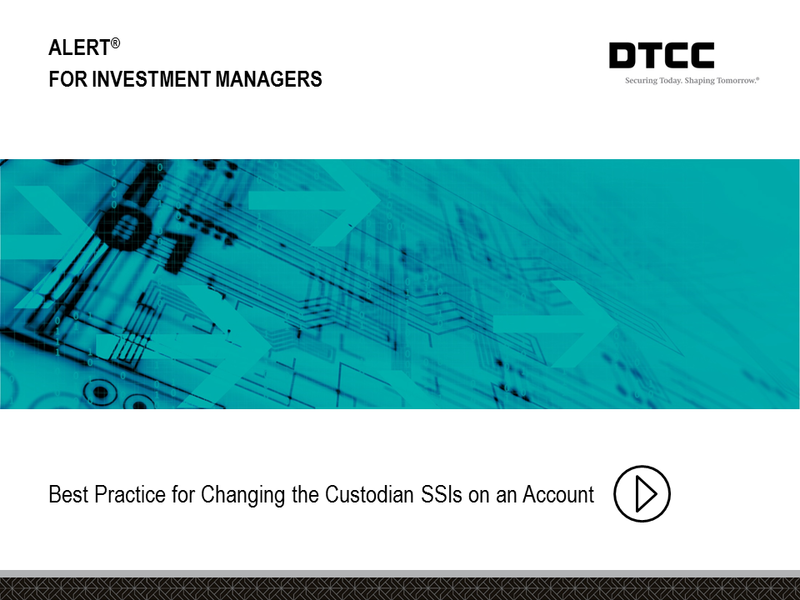 Follow the steps in this video when changing the custodian SSIs linked to an account. Learn how to get started with the ALERT® homepage. 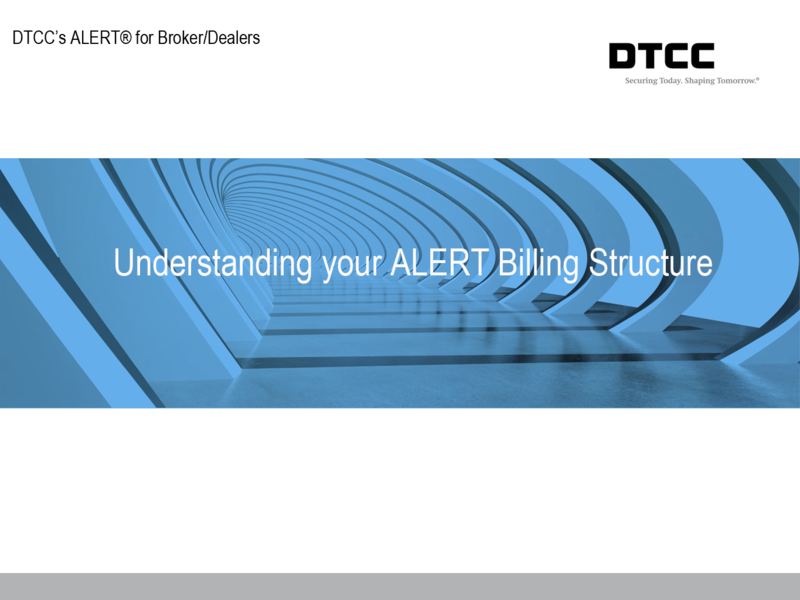 The ALERT® for Broker/Dealers Training Curriculum will get you started using the ALERT® for Brokers application, or provide you with a refresher of the basics. 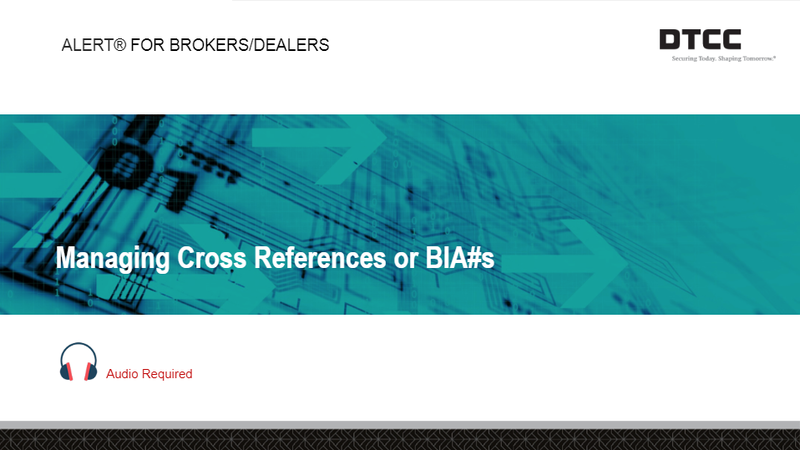 The ALERT® for Broker/Dealers – FX and Cash will get you started using the ALERT® for Brokers application, or provide you with a refresher of the basics.